"Let's eat in Downtown tonight", Gadget Girl texted out-of-the-blue. Uh... Have they abolished the GST? Did the Dodo not go extinct? Do people suddenly know how to navigate a traffic circle? Did she lose her mind all-of-a-sudden? The likelihood of her actually choosing to eat in Downtown after our Friday night games is as good as finding a non-slippery floor in a Chinese restaurant washroom. But I guess we can't look a gift horse in the mouth right? So off we went to ShuRaku since it was near where she wanted to be (yes, there was a reason...) and it was open late. Whenever Bear is around, we are destined to have something with sesame in it. Hence, we started with the Gomae. Unlike some of the common versions out there, this one was not slathered in an obscene amount of sweet syrup. 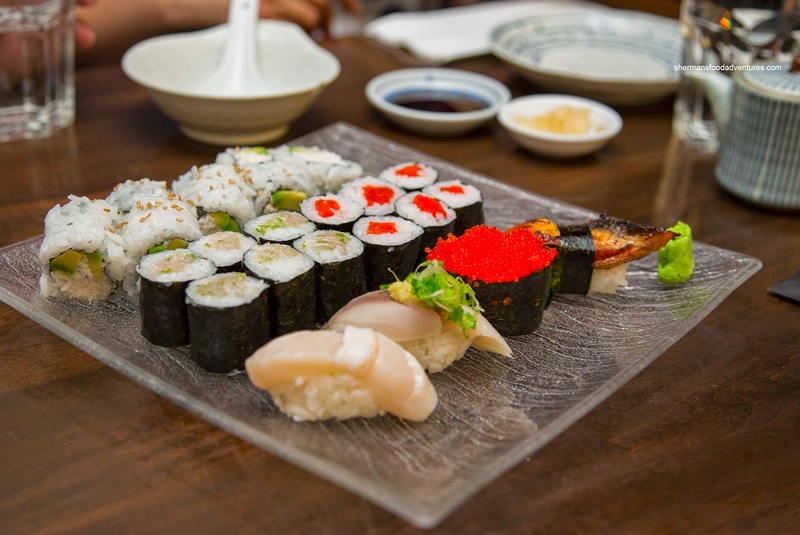 Rather, it was only lightly dressed with sesame puree exhibiting barely any sweetness. In fact, it could've been more impactful, but this was at least legit. 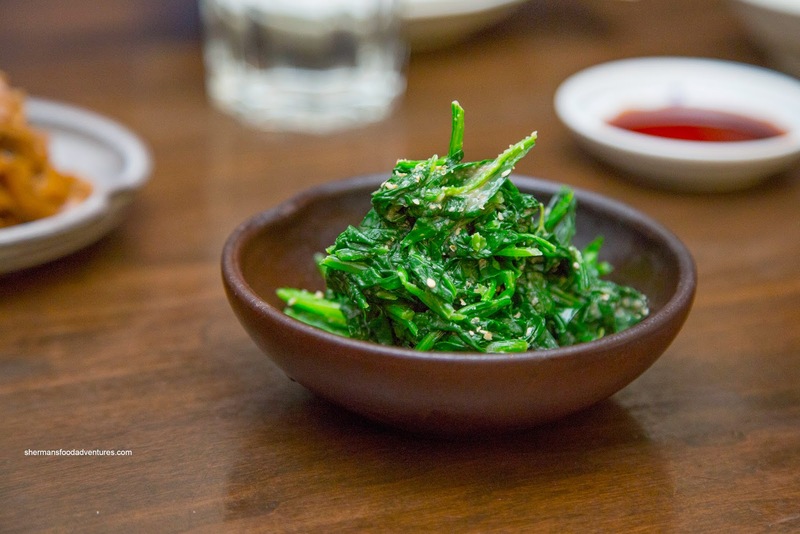 The spinach itself was prepared nicely with a slight chew while being tender. 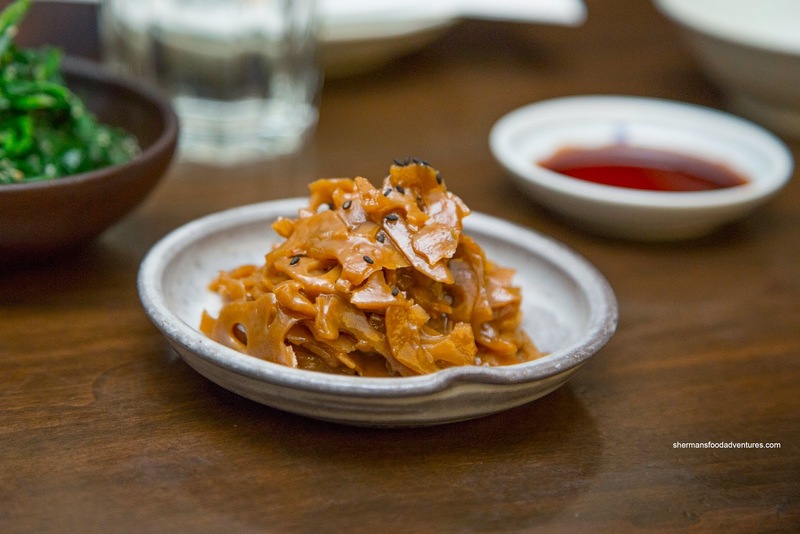 Next up was the Renkon Kinpira (lotus root sautéed and simmered in sweet soy sauce, sesame oil with a hint of chili). Sweet Tooth and Bear, being Japanese, were a bit indifferent with this dish. The spice level was a bit too understated as it gave way to the heightened sweetness which ended off with a noticeable saltiness. We did like the crunchy texture though. 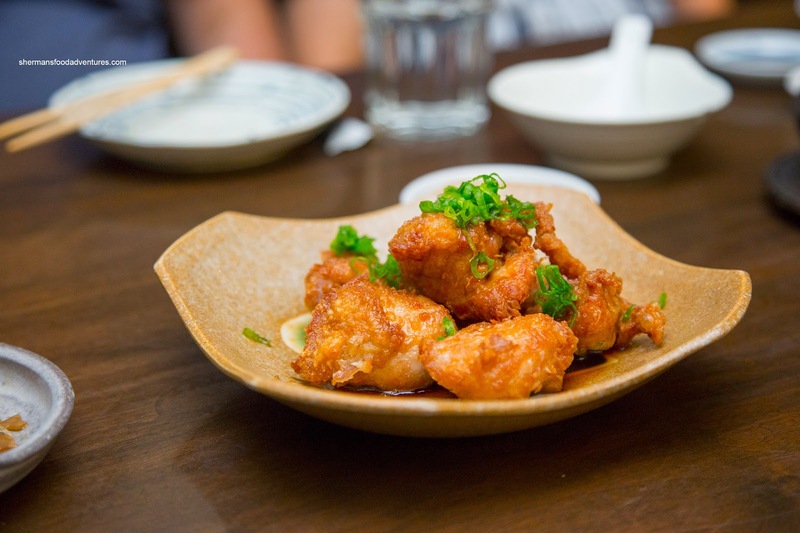 Onto the some meat dishes, we had the Chicken Nanban described as succulent chicken thigh, deep fried & drizzled with sweet and sour nanban sauce. I would say the description was more or less correct as the thick pieces of dark meat retained a juicy moistness. There was only a light crunch from the exterior deep fry while the sauce was enough to seasoned the meat (without being overly salty). 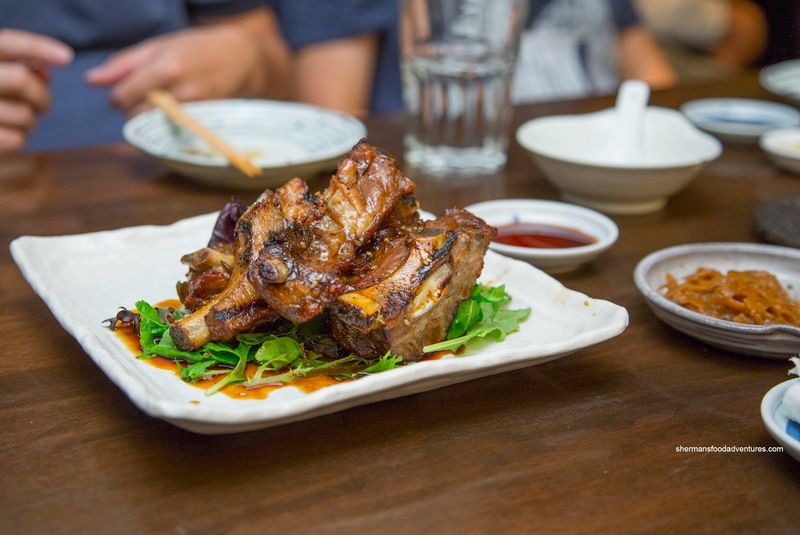 Next, we had their signature dish being the Japanese-Style BBQ Back Ribs (Fall-off-the bone tender Canadian pork back ribs glazed with our own secret BBQ sauce). These were indeed moist and tender. They were also really big with plenty of meat clinging onto the large bones. As for the glaze, it was sweet with a touch of savouriness. We had something a bit more healthy with a plate consisting of Nigiri, Negitoro Roll, California Roll and Salmon Roll. I found th sushi rice to be slightly on the drier side, but it still had an appealing chewiness. It was mildly seasoned, but was hardly bland. We found the fish to be appealing with a nice sheen and a fresh taste (as fresh as flash frozen can get). Everything was neatly prepared as evidenced in the picture. 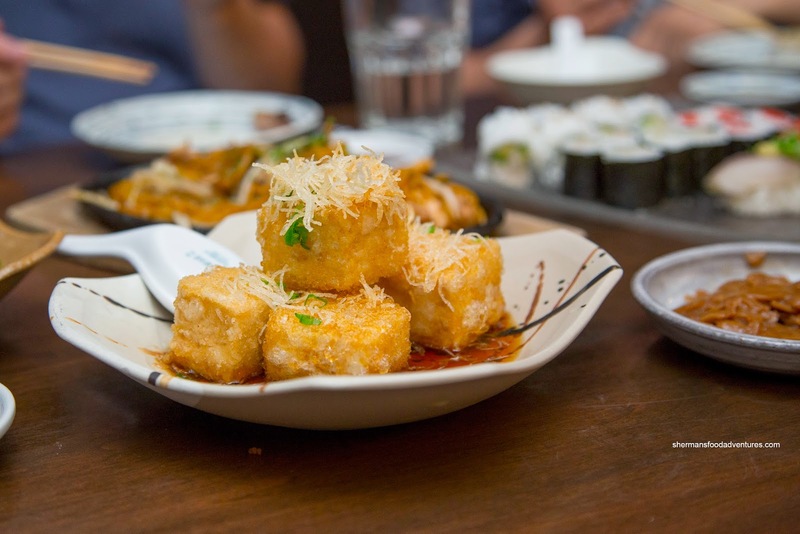 The Agedashi Tofu was a hit and miss in one dish. I found the the exterior of the tofu to be crispy, but beyond that, the coating became gummy. Hence, the batter merely slid off after one bite. The silky tofu was a positive though as well as the balanced sauce. 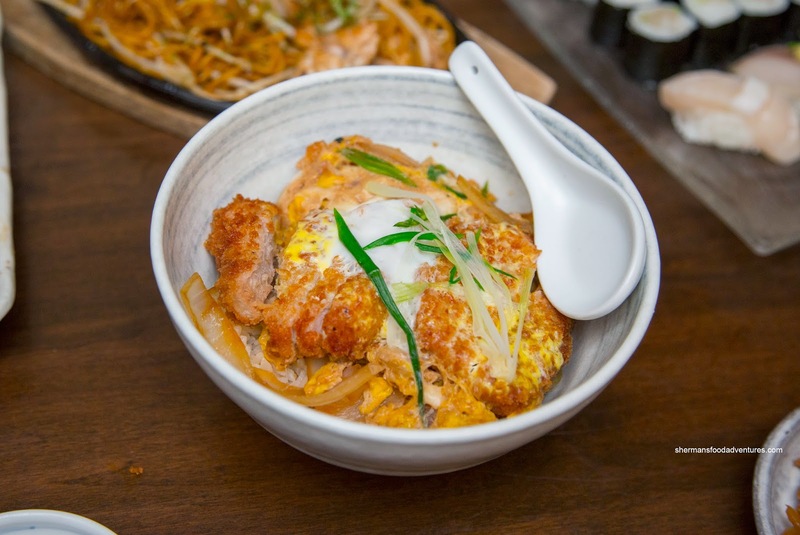 Heading into some carb-heavy items, we had the Chicken Yakisoba and Pork Cutlet Don. 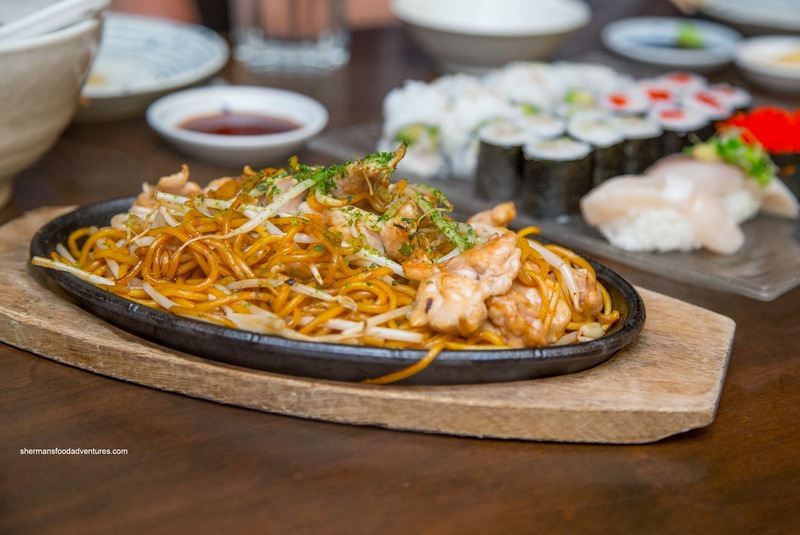 Arriving on a sizzling hot plate, the yakisoba featured chewy noodles which were the beneficiary of the sizzle. Hence, there was some smokiness that went well with the caramelized sweetness and a note of zippiness as well. The big pieces of chicken were sufficiently moist, but in need of a more seasoning though. As for the pork cutlet don, it was not very good. We found the meat to be overly dry and chewy while the panko coating to be completely softened. The rice was dry and chewy which was the correct preparation, however, the lack of sauce meant that the don was also lacking impact. Lastly, we had the Sake Miso Gindara. 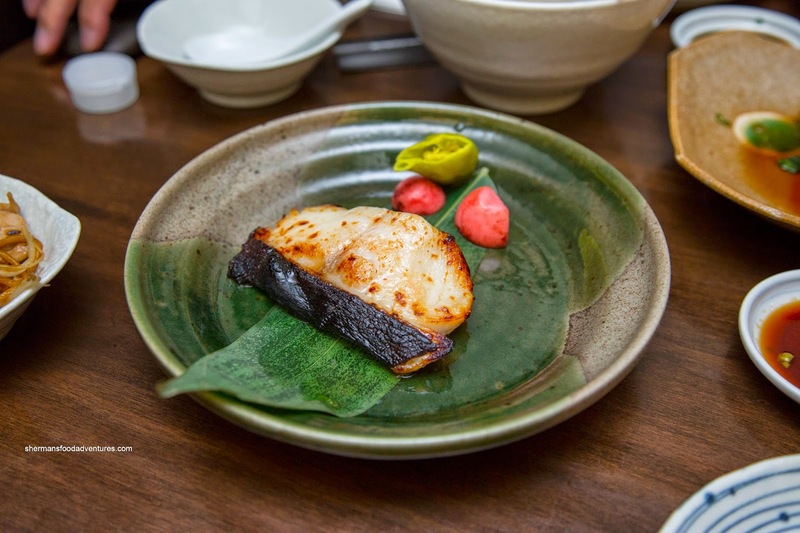 As much as some people would like you to believe black cod is easy to prepare, that is not always the case (especially with a sake marinade). This one was done right as the fish retained its texture and integrity being flaky and buttery. Both the sake and miso were noticeable penetrating all-the-way-through. This was a well-executed dish. Overall, we satisfied with the eats, especially for late night. 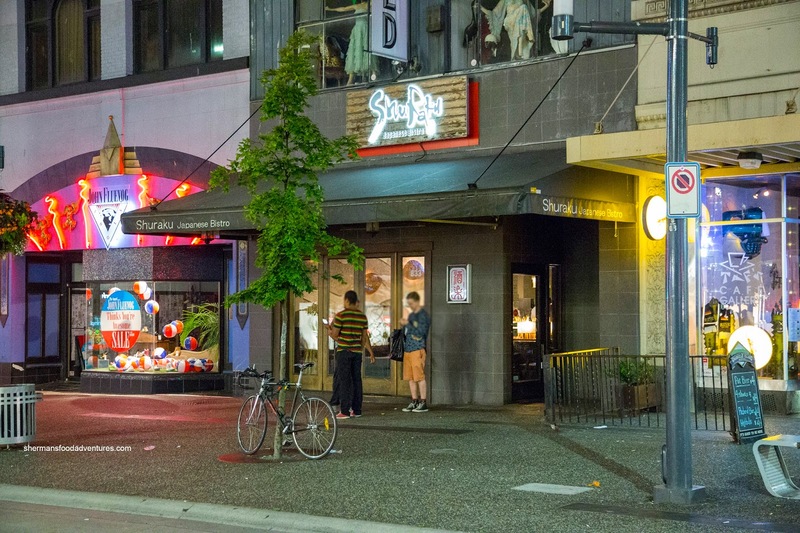 Considering ShuRaku is located right in the heart of the Granville Entertainment District, the ambiance was low-key enough for us to have meaningful conversation without needing to yell.